An increasing number of studies and primary resources are available for social science research on Tibetan areas and populations. A few databases and other helpful resources are listed below. FBIS reports in the 20th century translated articles in foreign-language publications largely for the purpose of US intelligence work. Fortunately, these many thousands of print publications are now digitized and searchable online through a Columbia University Libraries subscription. A quick keyword search for Tibet* (use the asterisk for a truncated search) generates nearly 16,000 articles. Try an Advanced Search to limit by original language (Chinese) and sort by chronology for interesting results! 1. While viewing a FBIS resource in READEX, choose EXPORT CITATION. (The .ris file will be saved in your Downloads folder.) You can also select multiple items, add them to “My Collection” and follow the steps below. Go to downloads and choose the .ris file. Click the “IMPORT” button. The citations now appear in Endnote. 3. Select whichever citation(s) you want to include in your bibliography. Select the desired reference in Endnote, and select the "PREVIEW" tab on the right. You can then copy and paste the citation. The “Annotated” output style seems to offer the most complete citation. ** To download the Columbia-licensed Endnote bibliographic software to your computer, see here. SOSHOO SOU SHU = 搜数 For English search interface, see here. Offers yearly and monthly statistical data on social and economic situation of China. The information sourced from several thousand national and provincial statistical yearbooks, industrial yearbooks, the People's Bank of China Quarterly Statistical Bulletin, China's Customs Statistics, etc. since 1997 with some dated back to 1949. Users can download data into an Excel sheet. TIBET STATISTICAL YEARBOOK (1991-2015), available with English interface in the China Statistical Yearbooks Database. 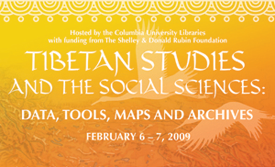 On February 6-7, 2009, the Columbia University Libraries hosted a hands-on workshop entitled "Tibetan Studies and the Social Sciences: Data, Tools, Maps and Archives." For more information, please see the links below.